The number of TB cases in India is rising every year. How safe are you? 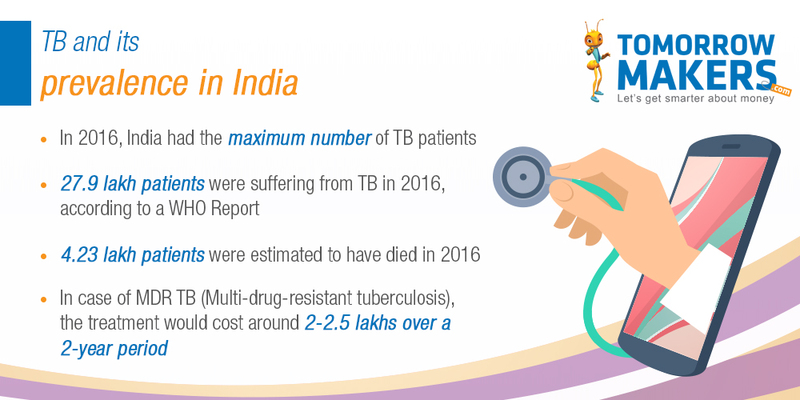 India is a force to reckon with on many fronts – market size, economic growth, software exports, military size, diplomatic influence – but there are also some areas where the country’s prominence is alarming: for instance, the extremely high incidence of Tuberculosis (TB). In fact, according to the World Health Organization (WHO), India is the worst-affected country in the world. In WHO parlance, countries that are particularly affected are dubbed HBC (High Burden Countries), a list that India tops with an estimated 2.79 million cases. To put the figure in better perspective, only ten of India’s largest cities have a population more than its TB-infected populace, as per the 2011 census. The number of TB cases in India surpasses the population of many non-metro state capitals such as Patna, Bhopal, or Chandigarh. What is worrying is that about 40% of India’s one billion-plus population is feared to be infected with TB. The comforting news, on the other hand, according to the UK charity Global Health Education, is that the vast majority of India’s affected population has only ‘latent TB’ – a condition where the bacteria exists in the body in an inactive state and causes no symptoms – rather than the full-blown disease. Nevertheless, the question remains: are you safe from TB? To answer this, you must understand a few pertinent (and primary) issues related to the disease in the Indian context. Related: How can you secure yourself financially against the threat of kidney disease? TB is an infectious disease that affects the lungs but can also affect other organs such as the kidneys, spine, or brain. If a TB patient is not given the correct treatment, it can prove fatal. Often someone may be infected but not have full-blown TB; they too may need treatment to prevent the disease from developing in the future. TB is caused by a type of bacterium called Mycobacterium tuberculosis. The condition spreads through the air when a person with an ‘active TB infection’ in their lungs (pulmonary TB) coughs or sneezes, and another person in the near vicinity inhales the droplets that contain expelled TB bacteria. Pulmonary TB is contagious; it can spread when a person who has active TB breathes out air when spitting, laughing, or even talking. Although contagious – after all, it’s an air-borne disease – tuberculosis is not easy to catch. What this means is that people are less likely to catch TB from a stranger, with whom interaction is likely to be minimal. On the other hand, chances of catching it from a known (but infected) person – someone at home, at work, or in the neighbourhood – are much higher because of the longer duration they spend in close proximity. Like most contagious diseases, TB thrives when conditions are conducive. Among the most common risk elements are crowded living conditions, alcoholism, and addiction to tobacco. So, people from the lower socioeconomic strata are especially vulnerable because of their poor diet, unhealthy living conditions, and weakened immune systems. People who have contracted HIV infection are also a high-risk group. TB is also often spread by migrants returning from a country or a city that has a high number of cases. Yes, TB can be checked with proper care: most people with active TB who receive the appropriate treatment for at least two weeks are not deemed a threat any longer. Those who have inhaled the TB bacteria, but in whom the disease is controlled, are referred to as ‘infected’. The disease is ‘controlled’ because the immune system of such people, while unable to eliminate the foreign substance, forms a shield of tissues. Infected people show none of the usual symptoms but frequently have a positive skin test for TB, though they cannot transmit the disease to others. This is referred to as Latent Tuberculosis Infection or LTBI. Related: If you faced a medical emergency today, could you cope with it? 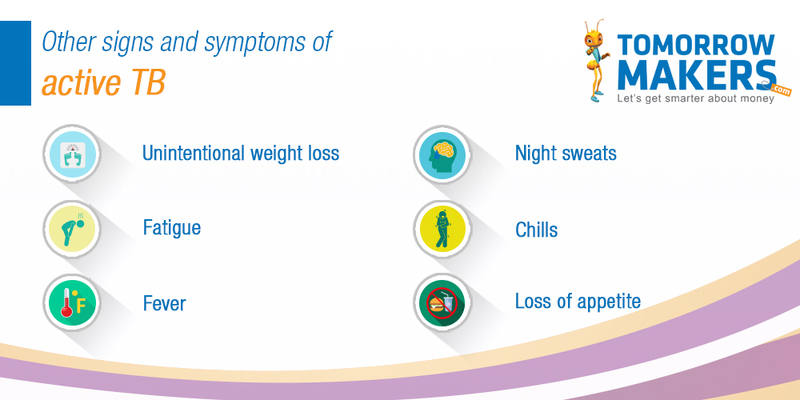 The symptoms depend on the area of the body infected. For instance, in the case of pulmonary TB, the patient may have a bad cough for more than two weeks and may cough up blood or phlegm from deep inside the lungs. There could also be pain in the chest. When TB occurs outside the lungs, signs and symptoms, vary according to the organs involved. For example, TB of the spine may lead to back pain, and in the kidneys, it might cause blood in the urine. It is advisable to go to a qualified medical practitioner for a correct diagnosis. Why is TB so prevalent in India? While you may feel like it is improbable for you to encounter a TB carrier, the truth is that just about anyone can have the disease- the doorman at a restaurant, the security guard in your apartment complex, the porter at the railway station, the cabbie… the list could go on. Poor awareness: In India, one of the main reasons for TB managing to spread the way it does is lack of knowledge. Even educated people are likely to ask how it spreads. You can only guess at the awareness levels of the illiterate millions or the barely educated. Unhealthy habits: It is hardly surprising that vast multitudes in the country have unsanitary personal habits such as spitting anywhere they choose (corridors, roads, stairwells of public offices). People even mindlessly cough and sneeze on others, which ‘encourage’ TB germs to spread freely through the air and enter the lungs of others. Overpopulation: Making matters worse is overpopulation, which has led to people living in cramped and unsanitary environments. These conditions are conducive to the disease spreading faster than it would otherwise. Inadequate diet: Given India’s poverty problem, a significant chunk of the country’s population is not only unable to maintain the required standard of health but is also deprived of proper nutrition that can help build a robust immune system needed for resisting the bacteria. Tobacco addiction: Indians consume tobacco products in various forms and vast quantities – usually smoked as cigarettes and bidis, or chewed as khaini or masala. Tobacco addicts are more vulnerable than non-users. Can personal hygiene be a factor? TB is not known to occur because of lack of personal hygiene, and there is no known link between the two; TB occurs due to weakened immunity or higher chances of catching the disease because of one’s surroundings. Lack of personal hygiene (including not washing one’s hands regularly) does increase the risk of infection, though this by itself need not lead to active tuberculosis. To be eligible for health insurance payment for TB treatment, you must be hospitalised for at least 24 hours. However, the problem with getting TB covered by such a plan is that the disease can be treated at home, just like fever, cold or malaria, and seldom requires hospitalisation for more than 24 hours. So, if a TB treatment requires a hospital stay of similar duration, insurance compensation will be available for expenses incurred during hospital treatment. But once you return home, your insurance may not cover medication and doctors' costs. For the same reason, ‘Outdoor’ consultations or treatments at hospitals are also not covered. Unlike cancer and heart-related ailments, there are no TB-specific insurance products, and this is mainly because of the “low demand” for insurance coverage. But media reports have quoted insurance firms as saying that special covers could be designed if there was demand for it. The disease is prevalent among economic segments of society where insurance has not penetrated to a great extent, and despite their TB-control initiatives, neither the central government nor the states have roped in insurance firms to push insurance among the vulnerable sections. Awareness, as a result, is low. The government has in place a National Strategic Plan (NSP) for TB-control, with the updated plan for the 2017-25 period envisaging a “TB-Free India with zero deaths, disease and poverty due to tuberculosis” by 2025. However, the challenge is “daunting”, it admitted, and that “the rate of decline (of TB) was too slow”. One of the many steps the government has taken is distributing free medicines through state-run health centres. It has now decided to use privately-owned pharmacies, keeping in mind patients who may not have access to health centres, and talks were on with the states to take this forward. Given that TB manifests when your immunity is weakened, eating healthy is paramount. Also, avoid addiction to alcohol and tobacco to ensure your immune system can resist the bacteria. In a county like India, where TB is widely prevalent, the most vulnerable people you meet should be encouraged to maintain personal hygiene. Additionally, the environment in which you are living should be clean. You can contract TB from others spitting on the roads, as anyone among them could be infected. So, try to avoid unknown or suspicious environments, and lastly – no kissing strangers!